One activity that is highly recommended this spring is strawberry picking. It is a unique, family fun activity to do especial around the area of Half Moon Bay. It is surrounded by some of the most fabulous farmland. And some of these lands let you pick your own fruit. Here are the best farms for fruit-picking that will surely make your day a FRUITful one. Situated just outside of Stanford University, this family farm has been dishing out berries and homegrown fun since 1922. What started as 40 acres of strawberries is today a 285-acre California Certified Organic farm, dishing out fine crops of corn, tomatoes, squash and much more. When and what time to go? Summertime is U-Pick berry time at the ranch, with everything from raspberries to olallieberries on the menu depending on seasonality and availability. Picking days are Thursday through Sunday from 8:30 a.m. until 2:30 p.m. with a $3 admission for guests over five. Berries cost $4.50 per pound. 2720 Alpine Road | Portola Valley – Take Caltrain to the Palo Alto Transit Center, then transfer to the P bus toward #96-Campus Oval. Take the SLAC bus from #1 Serra Mall at the Oval and get off at the SLAC Hotel. From there, it’s about a 20-minute walk (or bike ride) to Webb Ranch. Drive south to Watsonville where the berries are a-plenty! Gizdich Ranch has ample parking right by the berries – perfect for the littles who don’t want to walk too far to the fun. Strawberry season is open now. Arrive early in the morning for the biggest selection and bring your own containers for picking. Hours: daily, 9 a.m.–5 p.m. Strawberries season is in May to July. 55 Peckham Road | Watsonville – From Highway 1 (southbound), take Riverside Drive EXIT, turn LEFT overpass, straight through downtown Watsonville (high school on left side), over a bridge, LEFT on Lakeview Road, RIGHT on Carlton Road, LEFT on Peckham Road. Swanton Berry Farm encompasses 200 acres in five different locations, organically harvesting a cornucopia of produce in addition to its ever-popular strawberries. It is open every day for u-pick and also has a great farm stand where you can buy pies, chocolate covered strawberries and other treats. Strawberries are available now and later on in the summer. Organic Strawberry U-Pick is now OPEN! Hours: Friday-Sunday, 10 a.m. – 5 p.m. Organic Strawberry U-pick is $4.50/lb for 0-10 lbs and $3.50/lb for 10+ lbs. The weather is quite variable on the coast so please bring farm appropriate layers and footwear (warm grubbies and closed toed shoes – there may be mud). 25 Swanton Road | Davenport – Take Caltrain to San Jose (one hour) and catch the bus 17 to Santa Cruz Metro & Pacific Station (1 hour). From there walk or bike about a mile to the farm. Note that with transfer times, the journey could take up to four hours. For a day trip, driving is probably a better bet, but check out Zimride to set up a carpool with folks going your way. Coastways Ranch can be found on scenic Highway 1 in Pescadero. They offer u-pick strawberries at a beautiful coastal location (which can get windy so make sure you bring a jacket). 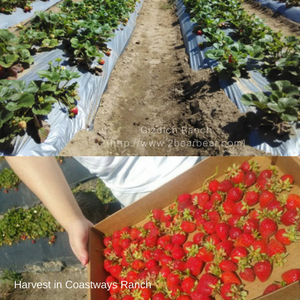 U-pick season is finished at their Coastways ranch as of the moment but you can still visit them at the farm stand in Davenport, CA for organic u-pick strawberries. When the picking season starts for 2017 they operate every Friday-Sunday 10am-5pm. 640 Highway 1 | Pescadero, Ca – If you are driving south from Half Moon Bay, the entrance is on the left just past Ano Nuevo State Park. If you need a place to stay in Half Moon Bay during your strawberry picking, come and stay in Harbor View Inn. Located right across the street from the beautiful California Coast and close to many farms in Northern California, this is the Half Moon Bay hotel for you! Enjoy the breath taking view of the Pacific Ocean near Pillars Point from every suite, comfortable single king, single queen and double queen rooms, a free continental breakfast each morning before you go out on your u-pick adventure, and more!